‘Why, no,’ I would reply with a certain pride, ‘only English,’ and they would look at me as if I were foolish or crazy. But that’s the glory of foreign travel, as far as I am concerned. I don’t want to know what people are talking about. I can’t think of anything that excites a greater sense of childlike wonder than to be in a country where you are ignorant of almost everything. Suddenly you are five years old again. You can’t read anything, you have only the most rudimentary sense of how things work, you can’t even reliably cross a street without endangering your life. Your whole existence becomes a series of interesting guesses. Si estais leyendo la obra de Bill Bryson, estas en pensar, estas bien ubicado. Si estais leyendo el contenido del proyecto Bill Bryson, imagino tu nivel de Ingles es ya potencial tuyo. 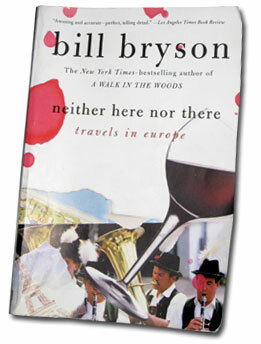 Todos los libros de Bill Bryson los asigno a mis alumnos que vienen a los Estados Unidos de la NorteAmerica. Sus libros son completa educación para recibir conocimiento de lo que es este país y lo que es el idioma INGLES. Si tienes interés, envio este video de uno de sus libros: Journeys In English. Este video y el libro los hago mensualmente y mensualmente, diariamente aparece algo nuevo, un descubrimiento. Estoy viviendo una realidad que ahora recibo personas, recibo Asiaticos y Europeos que saben de mi y yo no se de ellos. Cuando informan a mi que vienen para “aprender mas Ingles”, inmediatamente sugiero, en ocasiones obligo que lean a Bill Bryson antes, antes de venir a los US of A. Esto es para ellos ahorrar tiempo, ahorrar en su inversion y lograr un mejor vivir en este país. Los libros de Bill Bryson hacen mi ocupación mas efectiva, mas rápido todo y logramos hacer mas en un corto tiempo. Bryson es nacido y formado una parte de su vida en IOWA. The Heartland of the USA. I may have already sent you an email like this one before. Tomorrow will be 50 years, 50 years ago and I still remember watching the ABUSE made to African Americans, to NEGROS, as Presidente Lyndon B. Johnson would call them. Below you will see the Edmund Pettus Bridge. Using Magritte’s words I would say: This Bridge is NOT a Bridge. Magritte said : “This is not a Pipe”. This is, this was the beginning of the possibility of more CIVILITY. The march in Selma, Alabama would make it possible for The United States of America to have an African American President. President Barack Obama and his wife Michelle Obama’s ancestors were SLAVES who participated in the foundation, the construction of what is The White House, The Capitol Building and many of the WHITE monuments in the city of Washington, D. C.
Odetta the artist, the singer, was to sing in the Inaugural Ceremony when President Obama was first ELECTED. Odetta died, she went HOME just hours before the Inaugural Ceremony. Odetta was a vital part of the Civil Rights movement. Odetta sings : This Little Light of Mine. This event happened in New York City. ONLY HOURS after the Twin Towers, The World Trade Center was MASSACRED by 2 airplanes. Are we either HERE or THERE? Or Neither HERE nor THERE?